Music director Thierry Fischer said he would celebrate the Utah Symphony’s 75th anniversary in grand style. And he’s keeping his promise. Fischer, together with symphony president and CEO Melia Tourangeau and board chair Dave Petersen, revealed the Utah Symphony’s 2015-16 season Monday at a news conference held at the Salt Lake Tabernacle. However, the focus will be squarely on the Utah Symphony. “We are showcasing the orchestra and the community, and all that is good about the people here,” Tourangeau said. It’s a concept that Fischer agrees with. To symbolize that he wanted the symphony’s 75th anniversary season to embrace the other major performing organizations in the state. “I wanted to celebrate in collaboration, because this is about all of us,” he said. There will be six major collaborations in the masterworks series in the new season: 1) Mormon Tabernacle Choir in Mahler’s Symphony No. 8 (Feb. 19-20, 2016, in the Salt Lake Tabernacle, part of the O.C. Tanner Gift of Music series; the performances will also be recorded for future release); 2) Utah Opera in a semi-staged production of Ravel’s comic one-act opera L’enfant et les sortiléges (Nov. 13-14 in Abravanel Hall); 3) Utah Symphony Chorus in several works on separate programs during the season; 4) Madeleine Choir School in Holst’s The Planets on April 8-9, 2016, with guest conductor Hans Graf, and in Mahler’s Eighth Symphony; 5) Utah Shakespeare Festival in Prokofiev’s ballet Romeo and Juliet (April 15-16, 2016); and 6) Ballet West in a newly commissioned choreography of Debussy’s ballet Jeux ( (Feb. 26-27, 2016). The new season will also see Fischer and the orchestra traveling to New York City. This will be the first time the ensemble has played in the Big Apple since 1975. They’ll perform in Carnegie Hall on April 29, 2016. On the program will be works by Haydn, Bartók and Richard Strauss. They will also give the New York premiere of Andrew Norman’s new Concerto for Percussion, which will receive its world premiere performance in Abravanel Hall on Nov. 6-7. The orchestra has also commissioned a new work from Nico Muhly which will be premiered on Dec. 4-5. Both this and the Norman concerto will be recorded for future commercial release. There will be a gala concert on Oct. 1 with piano superstar Lang Lang playing two works: Mozart’s C Minor Concerto, K. 491, and Grieg’s Concerto in A minor. “Proceeds from the gala will help support the tour to Carnegie Hall,” Tourangeau said. In between comments from the three symphony representatives, there were also musical interludes featuring the symphony’s brass section and principal timpanist George Brown; soprano Celena Shafer; and the Madeleine Choir School. For a complete listing of concerts for the 2015-16 season log on to www.utahsymphony.org/15-16-season. 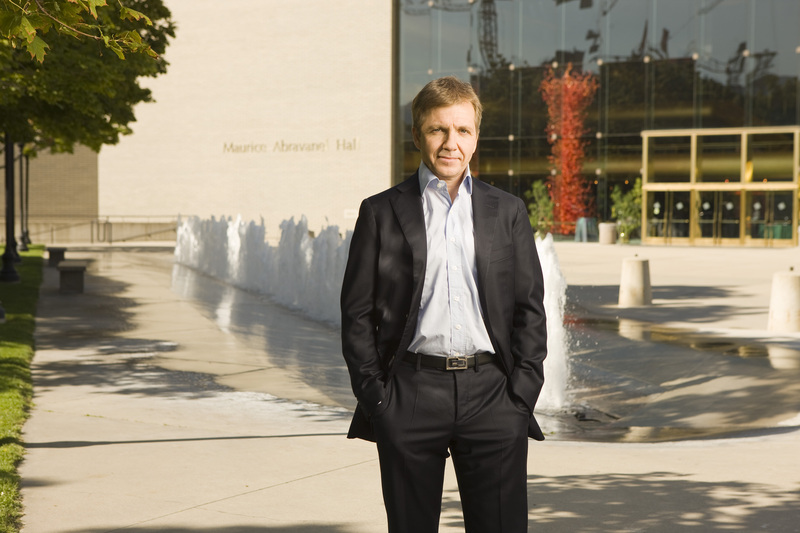 I agree that the 2015-2016 Utah Symphony season will be celebrated in style, and like Mr. Reichel, salute music director Thierry Fischer, the musicians, and the organization for ever spiraling levels of performance excellence and commitment achieved in the last several years. The programming of the first eight of Beethoven’s symphonies over two successive weekends is a great surprise, but is certainly a way to focus on achieving superb performances–with the added benefit of helping to increase the size of prospective audiences. I would contend that we could still retain and expand our audience without frequent performances of Beethoven’s symphonies, but this more innovative approach to Beethoven should also be a challenge and attraction for audiences who have heard many live performances of these symphonies in Abravanel Hall. With the last five of Gustav Mahler’s completed symphonies added to the mix of repertoire, the challenges of creating superb performances would appear daunting. But I believe this is all in a spirit of performance that former music director Maurice Abravanel would have supported, and a fitting way to honor him, our community, our audiences, and our musicians. I believe that the musicians and Thierry Fischer will meet the challenge. A real surprise is that the two world premieres and Utah Symphony commissions by Andrew Norman and Nico Muhly will be recorded live for future release. This month’s world premiere performances in Abravanel Hall of American composer Augusta Read Thomas’s EOS, a Utah Symphony commission, will also apparently be recorded for future release. Ogden will actually be the site of the true world premiere on February 19th. Hopefully the recordings of these three new orchestral works will be released together, perhaps on the Reference Recordings label, just as the recording of Mahler’s Symphony No. 1 made in September 2014 is scheduled to be released this autumn on that record label. This new slate of recordings is just the type of recording project and imaginative programming that should be supported in today’s market of commercially produced orchestral recordings. We should strive to mix the old and the new, finances permitting of course. The collaborations are not unexpected, but are also fitting and more than worthy of our seventy-fifth anniversary season. With the performances of Prokofiev’s Romeo and Juliet along with members of the Utah Shakespeare Festival, we may be able to hear something closer to the uncut score in all of its glory–too often we just get variations on the theme of excerpts and highlights–suites. The collaboration with Ballet West on a new production of Claude Debussy’s ballet music Jeux is an imaginative choice of repertoire. For this program, we get a pairing with Louis Moreau Gottschalk’s Tarantelle, which Maurice Abravanel recorded with the Utah Symphony several decades ago. If I am not mistaken, guest pianist Louis Schwizgebel will also perform with the orchestra in this piece. Gottschalk is a truly neglected composer who just happens to have been American. This is truly an outside the box selection. What can one say about the collaboration with the Mormon Tabernacle Choir on Mahler’s No. 8, or “Symphony of a Thousand.” This is also scheduled to be recorded and released on the Reference Recordings label. The soloists have not been announced, but it would be a nice touch if some fabulous local singers could be included, like Celena Shafer and Tamara Mumford. I was hoping for a dark horse selection, like Swiss composer Frank Martin’s Le Mystere de la Nativite–but that is a Christmas oratorio, with only two recordings on rather obscure record labels. We did in fact hear Mahler’s Symphony No. 8 performed in the Tabernacle on an earlier Tanner Gift of Music concert in 2002. Another observation: there are quite a number of recordings of Symphony No. 8 today, compared to when Abravanel and the Utah Symphony made their recording in 1963. But I have faith that our new one could be one of the best. The planned performance in Carnegie Hall is also a surprise. Including Andrew Norman’s percussion concerto on the program is one of the best possible choices–something to help attract the more serious press coverage found in some publications that cover orchestral music. It could also help attract more expansive demographics. Including a symphony by Joseph Haydn is also a move of some daring, but his best symphonies can stand comparison with any ever written. So who travels to Carnegie Hall to perform a Haydn symphony–we do. I would say all that might be missing is performances of works by arguably the greatest Utah composer of orchestral music: Leroy Robertson. His is Trilogy, for orchestra, and Passacaglia for orchestra are worthy of performances and recordings by our own Utah Symphony. The future of the Utah Symphony appears to be glowing again like it did under Maurice Abravanel. I am so happy to be a small grain of sand–in the audience no less–in what hopefully can become a much larger beach awash with innovation and inspiration.